Did you convert to the vSphere Web client when you installed vSphere 5.5 or 6.0 ? Are you using PowerCLI ? Do you sometimes use SDK API methods for those special scripts ? If you answered yes to some of these questions, you must be missing the Onyx Project application ! Well, your patience is rewarded. 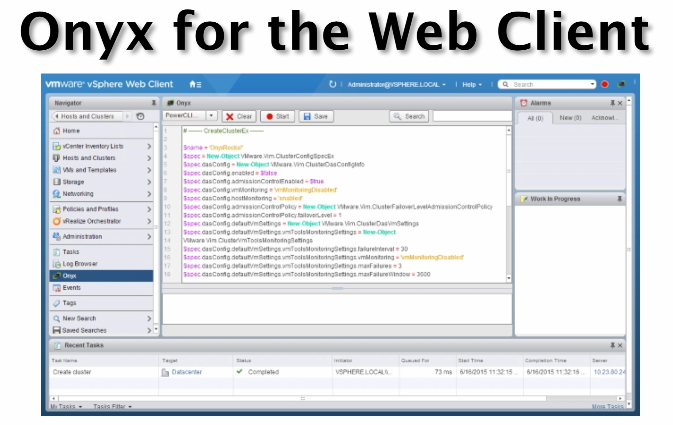 In the Fling repository you will find, starting today, the new Onyx for the Web Client v1.0 package. With the new Onyx you can watch which methods and properties all your Web Client actions are using. And with that knowledge you can easily ascend another level or two on your path to automation nirvana ! The installation of the Onyx for the Web Client is very straightforward. Since it is a fling, there is a word of warning that you should not install this on a production box. The installation replaces a number of core Web Client files. So make sure to use a test or development box to install the fling. When you fire up the Web Client after the installation, you’ll notice two new icons in the Web Client’s toolbar. A tool can not be simpler to operate than this new Onyx for the Web Client. If you have a VCR, you’ll probably guess that the red circle icon means Record. Once you click the icon, it will change into a red square. Yes, you guessed right, similar to the Stop function on your VCR. Between the Record and the Stop, the Onyx for the Web Client fling will record all your activity in the Web Client. When you have thus recorded your activity and hit Stop, it’s time to see what was collected. That’s where the second icon, the PowerCLI icon, comes into play. Click it, and a new window will open in your Web Client. So what are you waiting for ? 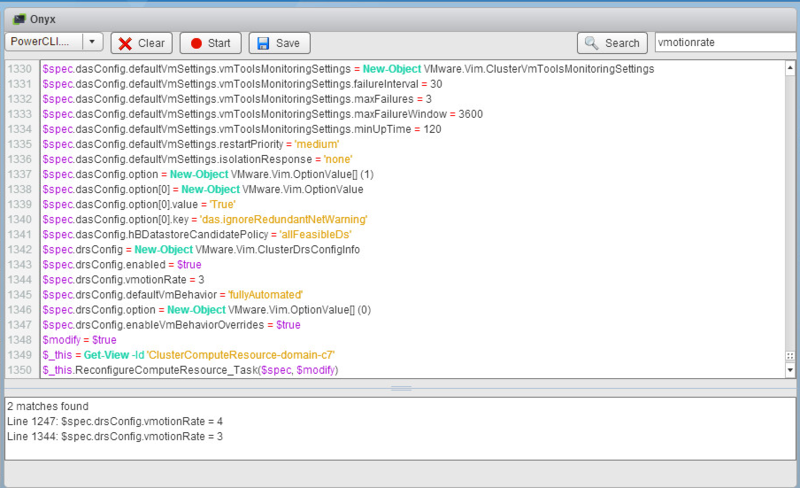 Go and download this indispensable tool now if you take your PowerCLI scripting serious. Did you see the feedback entries on the site ? There is a U1 version now. Did you try that one already ?